The University of Faisalabad is a multi-disciplinary University having faculties of Health Sciences. Engineering, Management Studies and Arts & Social Sciences offering various under graduate and post graduate degree programs. All the programs have been duly accredited/ approved by the respective bodies such as Pakistan Medical and Dental Council, Pakistan Engineering Council and Pharmacy council of Pakistan. The University was established under the auspices of Madinah Foundation, a “not-for-profit, Philanthropic Organization”. University Medical & Dental College (UM & DC) of the University is offering Bachelor of Medicine & Bachelor of Surgery (MBBS) & Bachelor of Dental Surgery (BDS) programs. Madinah Teaching Hospital (MTH) attached to UM & DC has State of the Art infrastructure and latest equipment for all the major departments. MTH is offering free medical facilities in all areas of health care including free food to the hospitalized patients. Department of Ophthalmology has also the facilities of Cornea transplant for needy patients. The Hospital regularly organizes free eye camps and conducts awareness seminars for epidemics such as Dengue and diseases like Diabetes, Hepatitis and Dental care. The University of Faisalabad is a leading University among the private sector Universities and has been placed in highest category“W4” by the Higher Education Commission of Pakistan. Quality enhancement cell (QEC) has been established & strengthened to ensure that learning outcomes are being met and continuously improved. The assessment of various programs being offered at the University is done through Alumni & Employer surveys. The University has signed MoUs with leading foreign Universities including Victoria University Melbourne, Australia, University of Bradford UK, Asian Institute of Technology Bangkok, Thailand, and Idaho University Moscow, USA for exchange of faculty and students and to undertake joint research projects. In addition we have signed MoUs with University of Agriculture Faisalabad, Pakistan, International Islamic University Islamabad, National Institute of Fertilizer Research and Engineering, Faisalabad. Mass Marriages- The management of the University organizes mass marriages of economically deprived classes of the society on regular basis. Number of couples ranges from 50 to 100, who are provided dowry consisting of essential family requirements of a couple. Summer Schools for Community at Large– The University organizes regular summer schools of two month duration fully sponsored by the University for the professional training of unprivileged people in the areas of English, Basic computer skills and subjects of humanities. The participants are provided free pick and drop service to the University and back and also computer lab facilities are extended to them. Highly qualified faculty is engaged in this training. Heath Care Facilities:- The teaching hospital of the University provides diagnostic & treatment facilities to public at large. Hospital is very well equipped having latest infrastructure, machinery and equipment. Daily turnover of patients is around 2000 that are provided free consultation and treatment facilities. Services of highly experienced and qualified medical specialist s are available in the Hospital. 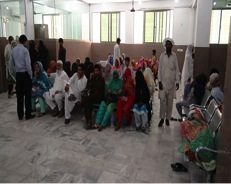 Eye-Camps– The Teaching hospital organizes free eye camps in and around Faisalabad on regular basis using latest techniques for eye operations. Medical specialists in the eye department are experts in Cornea transplant and many patients requiring such treatment are provided facilities free of cost. 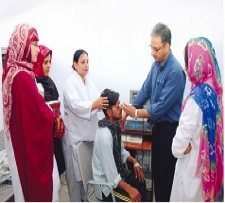 Rehabilitation of Flood & Earthquake Victims– The staff and students of the university have been playing an active role to rehabilitate people in case of natural calamities such as earthquake and floods.